The Monaco-based yacht design firm Pastrovich Studio has revealed X-Prime a new concept for an 80 metre superyacht which aims to combine “elegance, simplicity and sophistication”. The concept is based around putting “life on board” at the central focus and as result there is a single deck dedicated to the owners at the heart of the yacht. Rather than focusing on creating one large spacious area the designers have instead opted to create different zones to enjoy. The result is a series of interconnecting areas for relaxing, studying and eating to give people private space without loosing a feeling of connection. 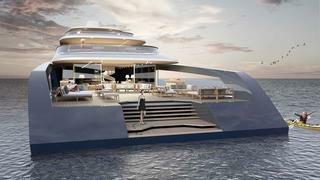 The design studio added that “this is suited to large families cruising together and making use of the yacht for extended periods of time”. The owner’s suite is on the top deck offering a private balcony and panoramic views, while the guests suites are located on the main deck with direct access to the main salon aft and the apartment deck above. 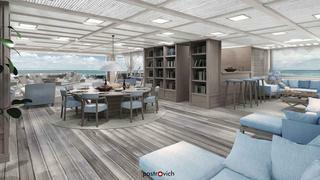 Another key feature of the X-Prime concept is its expansive sea terrace. The terrace is open on either side to give uninterrupted views of the sea. 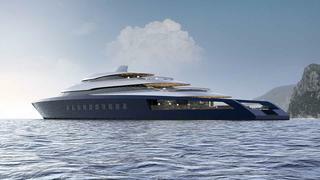 Other recent concepts by the Stefano Pastrovich, the man behind Wally's power range, include 92 metre X-Ballet and the 48 metre X-Alien.